Vangaveeti Radha convened a press conference on Thursday to offer an explanation on his exit from YSR Congress Party. 'Restrictions have been imposed on Me. After facing many insults, I came to a conclusion that My Father's goals can't be fulfilled if I continue in the YCP,' he said. The Former MLA questioned why should he seek anyone's permission to unveil his Father's Statue. 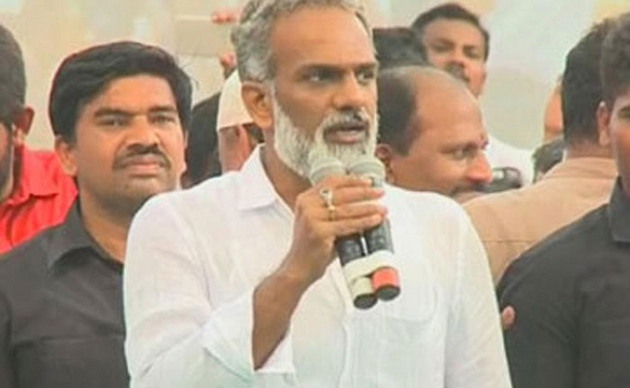 He demanded YCP Leaders to reveal what they had done when YSR's Statue was demolished in Vijayawada. 'YCP used my services extensively when it comes to luring other leaders into the party. Thereafter, Party kept on insulting Me. Jagan had gone to the extent of saying - 'Thandri Lenivadivanna Bhavana Thone Innallu Party Lo Undanichhanu'. Jagan claimed he treats Me like his own brother but made Me face many insults in the party,' complained Radha. Vangaveeti Radha opined the approach of Jagan towards him is different and that's something he can't tolerate. He even advised the YCP Chief to change himself at least now. Why did Vangaveeti Radha waited for 2 days to make these allegations? He could have made them soon after resigning to YCP. What is the reason behind the strategic delay? Ali's Loose Talk...Not Good For Political Career!